I have a confession. I have a strong prejudice against what agency people call as “initiative PSA”. (For those outside the ad agency business, PSA stands for public service announcement. It’s advertising about public or social issues like climate change, human rights, domestic violence, etc. In “normal” PSA, usually government or NGO clients commission ad agencies to make them. In “initiative” PSA, the agencies make them first, and then finding the clients who agree to sign them off). The first reason I’m very skeptical about initiative PSA is because too often they are not well thought of. Of course agency people have much more limited understanding about, let’s say, child trafficking in rural Java compared to my friend who heads The Center of Child Protection in University of Indonesia. Let’s say we want to try to reduce the numbers of children being trafficked in a village. Whom will we address as the audience? The children being trafficked? The children who are vulnerable to be trafficked? Their parents? The village head? The villagers? The policy makers? People who can influence the policy makers? What is the barrier? What exactly hinders the target audience from doing the thing we want them to do? For vulnerable parents, is it about abject poverty? For villagers, is it about the attitude of “mind your own business”? For the village head, is it about the belief that he has no power to do anything? For policy makers, is it about lack of interest in that subject? What needs to change? At the most fundamental level, I second Clay Shirky that behavior is motivation filtered through by opportunity. This means that to start a new behavior or stop an old one, we must decide where we want to focus on. If we target the parents who face dire poverty so “selling” their daughters to a trafficker doesn’t seem as a very bad idea, do we really think we should focus on their motivations? If we target the vulnerable children, should we ask them to keep motivated to continue their educations, while the nearest junior high school is 20 km away from their village? Please understand that I’m not accusing that all agency people who have come up with initiative PSAs are driven by selfish agendas. This is not the case, as proven by the real story behind one of the most wonderful ideas advertising people ever came up with: “Help I’ve Cut Myself and I Want to Save A Life”. 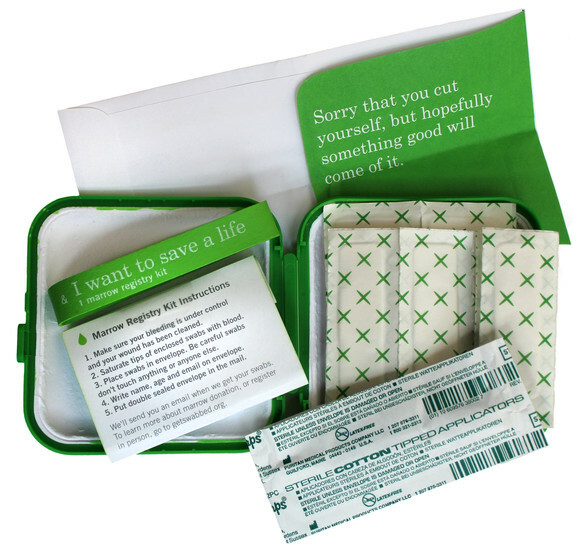 “Help I’ve Cut Myself and I Want to Save A Life” is a first-aid kit that consists of bandages and bone marrow kit. You accidentally cut yourself. You’ll need a bandage. And hey, while you’re at it why don’t you use that blood for the bone marrow kit? Post that kit to the written address, and who knows your blood will match someone’s who really needs a bone-marrow transplantation. After all, the odd of a matching blood between a donor and a recipient that’s not family related is 1 in 20,000. Graham Douglas of Droga5 came up with this idea. His identical twin brother had leukemia and was saved by a donor. This is why Douglas has always been preoccupied with this topic. But what I’m afraid is (and I genuinely hope I’m wrong on this) in most ad agencies the above story is an exception rather than the rule. I’m afraid that we advertising workers fail to see that when making initiative PSA, we are so close to exploiting people with dire problems for the sake of our fame and paycheck. I’m not advocating that advertising agencies stop doing initiative PSA. Not at all. After all, I am still in this business because I still believe that done right, advertising can change the world for the better. What I’m asking us to do (and I know this is a big ask) is to stop thinking about making initiative PSA. Start thinking about solving non-commercial problems that are close to our heart. Just like the story of Graham Douglas above. I think this is why the idea of bandages and bone marrow kit combo is brilliant. It is based on a very clear understanding on what the problem is, on what needs to change. It has a laser sharp focus on who the target should be, their barrier, and what they should do next. And the execution is simple, effective, and efficient. What irks you? What kind of stories boils your blood or drives you to tears? What kind of news shakes your emotions? Do you passionately believe that something needs to change in your environment or the society? Start from there. Let your anger, or frustration, or passion fuel you. What if you can’t answer those questions? What if nothing really bothers you in your environment today? What if you don’t see any needs for social or political changes? This can happen, I believe. If this happens to you, then I suggest you to meet non-advertising people, read non-advertising books or websites or articles, go to places advertising people don’t bother to visit. In other words, I suggest you to start living the real life. Agreeing with you. I always stayed away from PSA for awards; I couldn’t stand the voices of millions abused children, beaten up wives or terminally-ill patients behind my well-crafted yet pointless work.